In this tour you will be able to enjoy a delicious dinner and watch the world famous high cliff diver's show at La Quebrada. Enjoy a fantastic show at the traditional Mirador Hote and enjoy dinner at la Perla Restaurant which is built on the terrace from where you can watch the cliff divers show at night. The La Quebrada Cliff Divers are a group of professional high divers, based in Acapulco, Mexico. They perform daily shows for the public, which involve diving 35 metres (115 ft) from the cliffs of La Quebrada into the sea below. The depth of water in the "Gulch" can vary from 6 to 16 feet depending on the waves, with an average depth of 12 feet. Timing is crucial for the divers. During the night, they often hold torches while diving. 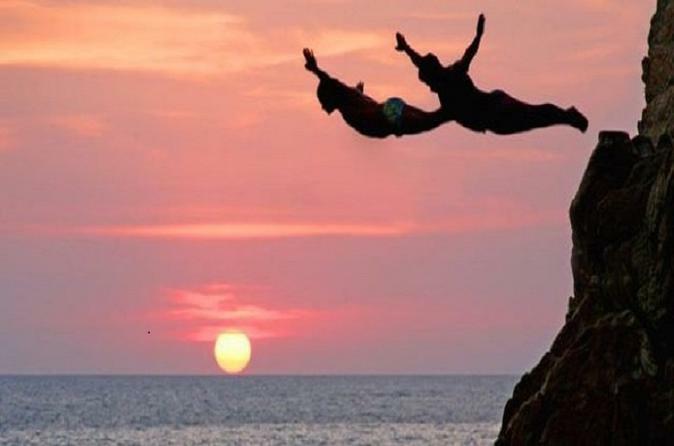 Acapulco cliff diving was regularly featured on weekend sports television programming in the United States during the 1960s and 1970s when the USA high diving team competed with the La Quebrada cliff divers annually during the Acapulco Christmas festival. The 2002 Guinness Book of World Records lists this as "the highest regularly performed headfirst dives" in the world.